Almost nineteen years ago, Touchstone Pictures asked What About Bob?, not knowing what a profound question this would be for the Supply Management space, which had not yet truly emerged, nineteen years later. And before you ask what is that crazy doctor referring to, be assured that I’m going to tell you. But first, a little background. Then Mr. Horses for Sources himself, Phil Fersht, decided it was time to go all-in with the new Analyst 2.0 model and formed a whole new Analyst Firm dedicated to Global Sourcing Performance. And now we have turmoil at the Analyst 1.0 firms who are trying to stay relevant. Gartner acquired AMR, and Andrew Bartolini, who was the VP of Global Supply Management Research (and who succeeded Vance Checketts who succeeded Sudy Bharadwaj who succeeded Tim “Mr. Perfect” Minahan), has departed Aberdeen to create his own Analyst 2.0 offering over at CPORising.com. There’s so much going on right now, and so much noise being made, that I just have to ask What about Bob? You see, while most of the space is going gaga over all of the hullabaloo surrounding the emergence of Analyst 2.0, they’re forgetting two important truths. One, it’s about substance and quality, not flash and delivery. And two, quietly toiling away over in a little corner of The Ferrari Consulting and Research Group‘s piece of the web, is Bob Ferrari who has been plugging away on Supply Chain Matters for over two years now, bringing you deep thought and analysis on a variety of topics on a weekly, and occasionally daily, basis. He’s good. He’s great. He’s wonderful. And he’s too modest to ask it himself. So I’ll ask it. If you need a real analyst, with decades of experience, including stints at IDC and AMR, What about Bob? This entry was posted in Analyst, Miscellaneous, Supply Chain on April 14, 2010 by thedoctor. The business case for a strategic approach to CSR in global sourcing has come to light in high profile businesses such as Ikea, who dismissed two Russian employees for allowing a supplier to pay a bribe. Further, in a recent CIPS report on Africa, bribery was seen as just a part of doing business. From the media, we often get the impression that most multinational corporations have already adopted CSR as an integral part of their LCCS strategies. In reality, only a small percentage of the world’s international corporations, and their suppliers, have seriously embraced CSR. Those that have typically implement a code of conduct for their suppliers. For example, Apple recently highlighted serious non-compliances with suppliers in countries such as China and Taiwan during a recent audit. The violations included employment of underage workers, improper hazardous waste disposal, false records and suppliers signing contracts with uncertified vendors. Unilever describes CSR as the impact of the business on society. When taken broadly, this definition clearly allows scope for determination of whether a policy is a power for good, or not, within the local context by conducting an impact assessment. When backed up by an ongoing program of continuous improvement, this can prove to be a powerful tool which can support the necessary response to the media should unintended consequences arise. 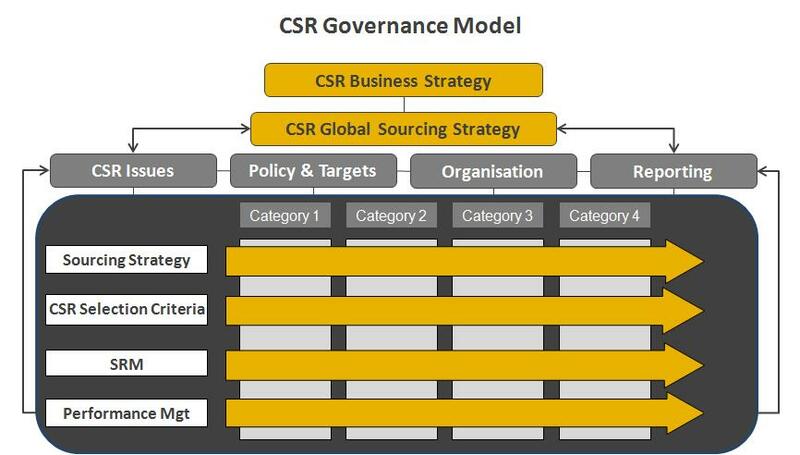 The governance model shown starts at the organisation’s overall strategic level to ensure CSR objectives and targets are consistent with the business’ overall goals. The CSR issues should feed into the overall sourcing strategy through detailed analysis (processes, spend, supply base, and feedback from the field and SRM initiatives for all categories). This helps establish both a baseline on a category basis and a holistic view of the global sourcing environment. The baseline then serves as the basis to prioritise future initiatives and also to measure their success. When getting started, it is best to focus on categories which have low complexity and to set achievable targets to establish quick wins. Ensure that the approach is cross-functional and that lessons learned are fed back into future initiatives. Part 3 will examine Risk and Opportunities in global sourcing. This entry was posted in CSR, Global Trade, Guest Author on April 14, 2010 by thedoctor.